I realize I never updated the blog after dropping out of Payton Jordan. I guess it was just a little easier to disappear for the season. As soon as I got back from California I got an MRI and was told that my plantar was partially torn. I could finish the season in pain with some band aid solutions, or I could call it quits for 2015 and take care of it with more extreme measures asap to make sure I’m pain free, healthy, and strong for 2016. Through this whole journey 2016 and the Olympic Trials have been my goal, and I couldn’t imagine running my best while in pain anyway. With the support of my podiatrist, coaches, parents, fiance (and his podiatrist brother), and friends, I decided to end my season before it ever really started and have my plantar fascia released. The surgery was just short of five weeks ago. I was non weight-bearing for the first week, partial for the second, and then in a walking boot. This past Friday I got to ditch the boot as well. I’m happy to report that everything feels great and, in addition to spinning, I was able to get on the alter-g for the first time today! I’d love to be joining my teammates at the USATF Championships this week and working on my sports bra tan by running outside, but for now I’m just happy to be on the road to recovery and I’ll stick to the alter-g and pink spin bike. I’ll be back at it soon. I had really been struggling to write a blog post without something specific and significant to report, hence another five month absence. I suppose I’ve kept pretty busy because the fact that it has actually been five months is shocking to me. This past week I was excited to have something significant and fantastic to report with my return to racing at Payton Jordan after my winter injury. I came back quick and strong, rejoined my workout group, and thought I was ready to fly. However, “fantastic” is not the word to describe what happened last night. On the comeback trail, I had come to accept that some plantar pain was my new reality. It needs some TLC and a few minutes at the beginning of each run to really loosen up, but everyone I talk to who has had plantar issues told me that is how it goes. As long as it loosened up, I knew my bone was fine and I was okay. I was working out better than I had been at this time last year, threw on the spikes a few times at practice to get a feel for it, and a few of us did a time trail a couple weeks ago. I was ready. Then I don’t know what happened. I was nervous before the race, but that made sense…it had been a while. The gun went off and fitness-wise I was good (at least for the mile and a half I stayed on the track). A couple laps in I felt a pain in the bottom of my heel. I tried to give it a few more laps, and it started to throb farther up towards my ankle and I panicked. Sitting in a coffee shop to write this while my teammates do their long run, my eyes are filling up trying to recall what was going through my mind when I decided I shouldn’t continue. Was this the right decision? Am I just being weak? Am I not accepting that it’s okay to feel some pain? Maybe everyone does… What does this mean for my season? For next year? I thought I was past this… Did I take my comeback for granted? Did I not give my foot as much TLC as it needed? I’m weak. That was dumb. I just ruined an opportunity in an amazing race. Holy Sh!t my teammates ran amazing. I train with them, I should have run with them. Why didn’t I run with them? Why did this hurt so much tonight when I’ve been working out for two months now? Repeat. I’ll know more after a MRI when I get home tomorrow. Finally, I’ve said it before and I’ll say it many more times after this, I have the greatest support system there is: A dad who flew across the country, a mom and fiancé who stayed up way late in EST waiting for an update, a coach who hasn’t stopped believing in me, NJ/NY teammates who ran their own great races and then made sure I was okay, Oiselle reminding me I’ll be back at it soon, and SUXC making it very clear that I’m always part of their family, it’ll be near impossible to stay down too long. Until I find out more and can plan my next move, I’m amazed, inspired, and driven by the 5k PRs of my teammates, Nicole Tully (15:05) and Ashley Higginson (15:18). Hoping to join them soon. It’s almost comical how much of my life (at this point) revolves around running. I realize that my blog has been very quiet since I got back from Europe. I have writer’s block. When I got back I wound up running two more road races at the beginning of August and then, with some extra encouragement from my plantar fascia, took a break. I started to write a little recap of my last two races (GNC Liberty Mile and Belmar Chase) and the importance of taking some down time, and then decided what I was writing was too boring. Don’t get me wrong, I’m proud of those races and I still think down time was important, but I couldn’t convince myself that it was worth finishing and sending out. Since it was still a part of my journey, here’s the short version: The Liberty Mile was really fun. I’d never been to Pittsburgh before and it’s a pretty cool city. I learned I need to work on my kick, and now I have my very own big head. Belmar was an awesome way to end the season. We (NJNY) got to sweep a race in New Jersey and then hang out at the beach a bit. Yes, my plantar fascia was starting to bug me toward the end. It was nothing terribly serious, but it has been a long and amazing year, so it was a pretty good time to take a physical and mental break. So back to my writer’s block and a life devoted to running…I was ready and a little excited for my break. And then three days into it I sat with my roommate, Rebeka Stowe, at the breakfast table with a list of goal for the coming year and a rough sketch of what my weekly mileage and trips to the gym would look like to get me there. I was already getting antsy and excited and ready to start again. Of course, it didn’t help that Rutger’s classes don’t start until next week, so my running break coincided with my work break. I spent hours each day looking at houses online for a group of us to move into, watched A LOT of Netflix, floated in my parents’ pool, woke up when I wanted and took my time drinking coffee and browsing Pinterest. The unemployed life was pretty nice, but I was itching to start one of my jobs again. Motivated, but reminding myself to be patient, on that third day I joined LA Fitness (Rutgers was always crowded and when classes were canceled, the gym was closed). I started slowly building back up with cross training and light lifting. At the end of two weeks of cross training and running twice, I sat down with Gag to talk about the coming year. It’s impossible to describe a conversation with him. He tells it like it is. He knows what you’re capable of and exactly what you need to do to get there. He knows it’s hard and it takes a lot of commitment and sacrifice, and he let’s you know that too. But I leave every conversation with him feeling more motivated and confident that this is what I want and that I will achieve my goals. Now I’m a week into the comeback with some awesome things on my plate. I have another year with Oiselle! And I’m super excited (and nervous!) to model for them when they return to Nolcha New York Fashion Week on September 9th. As of right now, I don’t have any races officially scheduled for the fall (no need to rush my foot) but there will be some eventually! That’s where I’ve been for the past month…mostly looking ahead. **And now you can follow NJNYTC on Instagram! 1. Pack less and re-wear clothes. I didn’t know what it would be like for me because my races were so close together that I didn’t have a home base. So through ten days, three countries, and four flights I carried a large bag with things I probably didn’t need. Of course running clothes become gross, but there are ways to do laundry and I can definitely cut down on street clothes. 2. Ireland uses euros, not pounds. And Switzerland uses Swiss francs, not euros, and is extremely expensive. Thinking I’d be in Belgium until the day before I came, I changed a bunch of money to euros. Then for some reason assumed Ireland used pounds and didn’t bother to do any research, switched to pounds and was wrong. Next time double check. 3. Bring your own shampoo, soap, and towel. This ended up being less of an issue than I originally thought. When I got to Cork, all I wanted was a shower and I was in a dorm room with a shower that didn’t turn on, no towel, and no toiletries. All was fixed by the following afternoon, but you never know where you’ll be and it’s probably best to be prepared. Also, every place I went had only liquid soap that was used as shampoo as well and no conditioner. European thing? 4. Looking both ways before crossing the street is even more important in countries where they drive on the other side of the road. I almost died. 5. Check in for flights and check your bag online a day in advance. The one time I didn’t do this, going from Dublin to London, a massive fee was attached to the bag. They told me that is often the case and it is much less if you do it online ahead of time. 6. Deer in England are not afraid of people. I was only in Teddington for a day and a half, but it was the perfect place for down time between races. Bushy Park was great for running, and the deer don’t even flinch when you go by. 7. Get out and see things. Of course it was important to remember why I was there and I made sure my legs were rested well enough, but I didn’t want to forget where I was. Running provided me with an amazing opportunity and I’m glad I took advantage of it and was a bit of a tourist as well. 8. Europeans love athletics meetings. Athletics meetings = track meet. Great crowds and, as mentioned in my race recaps, fanatic little children greeting you at the finish line to ask for your bib number and have you sign hats, t-shirts, and programs. 9. Track athletes are a special breed. Here’s the sappy part of my reflection on the trip. And instead of a lesson learned, it’s more like reassurance of something I’ve always known. But as someone who has never done this before, and without the teammates that I train with and know well, I was welcomed and guided by so many whom I’d only met a day or so before. Legs 2.5 and 3. 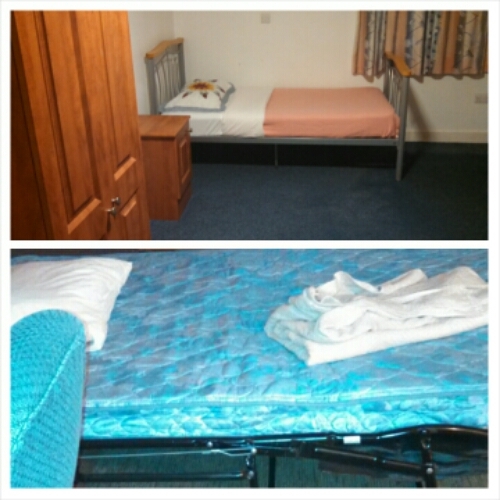 July 12: Dublin -> London -> Teddington by bus, and stayed until July 14 -> Zurich -> Luzern by shuttle. Teddington was a great spot to stop between races. Big thanks to the Brooks Beasts for welcoming me! Luzern might be the most beautiful place I’ve ever been. I had heard that it was from so many people before I came over here, so when it was cloudy and pouring rain the first day I was pretty disappointed. But I woke up today with the sun shining and got to see the amazing views in those pictures just a few blocks from my hotel. I wish I had more time to enjoy it post race, but I’m headed home tomorrow morning. 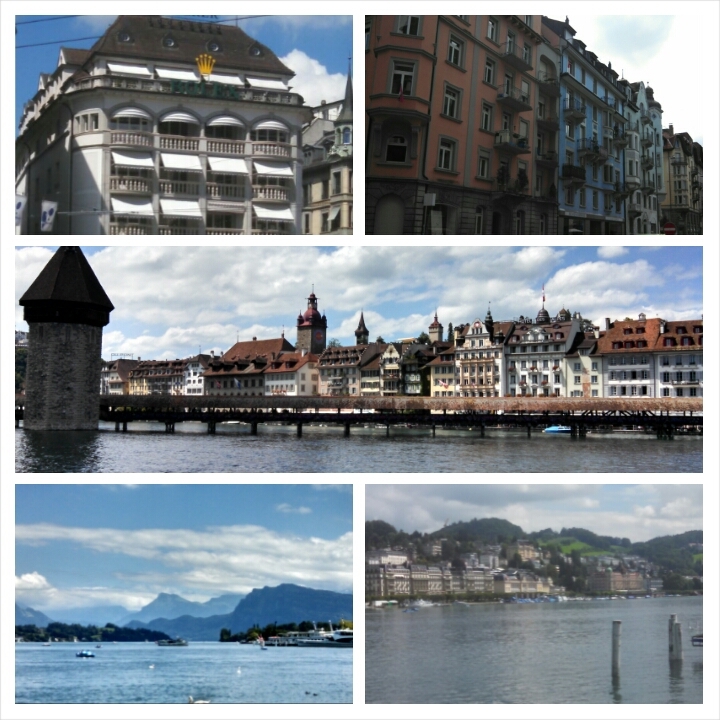 So Luzern was a quick trip for me. A nice walk to the river in the morning, followed by watching American TV shows in German (this was the only non-English speaking country of my trip), and a shake out was all I had time for before getting into race mode and heading to the track. Europeans love their track meets. The stands were packed and standing room around the whole perimeter was at least three people deep. And the whole event was like a fair with food carts and people walking around drinking beers and eating sausage. I knew the race was being paced well and that there were plenty of fast women. Within a lap the race had already split and only a few women went with the pace, so I had the option to go with them (even if it was a bit fast), start slower and settle with the second pack, or run alone between them. One of the things I’ve been trying to work on is not being afraid of fast races, so I decided to go with the lead pack and we went through a mile in 4:51. I held it for a little while, but by the last 2k I started to feel cooked. 15:43 for 8th. I really would have liked to end my Europe trip with a PR, but it was good to experience that and I’m glad I went for it. Trying to think of and be proud of everything I have done this year, and at the same time my mind is already filled with everything I can do a little differently to make next year even better. Spitzen Leichtathletik Luzern (the name of the meet:Top Athletics Lucerne) was a pretty incredible production. The night ended with amazing fireworks set off from the infield. They were pretty much right on top of while we stood at the 5k starting line collecting our bags and changing our shoes. Really cool end to a trip through Europe and a great send off back to the US. Leg 2! 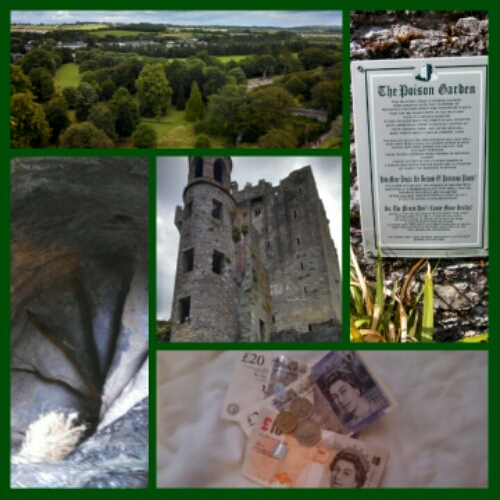 July 9: Cork -> Dublin by bus. Morton Games Mile. Blogging via my phone because my outlet converter mysteriously disappeared in my Dublin hotel room and my tablet is out of juice, so just a quick update for now. A new place with even more new people. I think I can be pretty outgoing at times, but I’ve never before spent so much time with people I only previously knew by name. I’m so glad I’ve had some awesome people to be a tourist with instead of being a hermit in my hotel room with no friends. On Thursday, I got to see a bit more of Dublin on another castle tour and a visit to the Guinness factory, which ends with a pint at the top of the building overlooking the whole city. Pretty sweet. As for the meet, I can’t think of many other races that have been more fun. I was a little nervous, which is natural, but even though I wanted a pr, I really felt no serious pressure and wanted to see what I could do. Having that relaxed attitude was definitely part of my success last night. I got in line with a perfect pace and a great field and it felt pretty amazing. Another 4th place finish, but I got my big pr. 4:28.02 🙂 Again, the little Irish kids all swarm you at the end, asking for your bib number, autograph, and selfies. The rest of the night was fantastic as well and I already hope I’m coming back to the Morton Games next year. Now I’m in Teddington for a short while before heading off to Luzern! Leg one of my European Adventure! 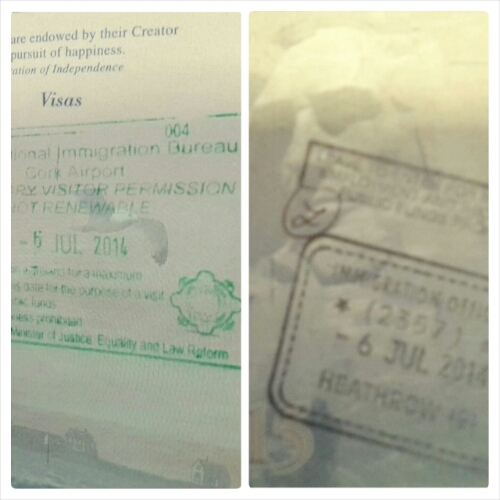 July 6: 8:15am NYC -> London -> Cork (just about midnight local time). Cork City Sports 3k. I’m an anxious person. And a planner. This trip is a true test in my ability to just go with the flow and trust that it will all work out. And fortunately, so far it has. My first day of travel was pretty smooth with no delays or cancelations. Though I felt like I was going through a maze, I made it through Heathrow Airport and on to Cork with two new stamps in my passport. The next morning I ran in Kyle Merber, NJNY teammate, who introduced me to more Americans, and I wasn’t alone anymore. We all went to the track for a run and strides together, and then took a short bus ride to Blarney to see the castle and kiss the stone. That night (night before the race) I was actually feeling tired, even though it was mid-afternoon at home. I thought my plan to force myself to get up early was working. So I played a movie on my tablet and fell asleep very quickly. Unfortunately, my body thought it was just an afternoon nap and I woke up two hours later. Once I fell asleep again, though, I was out for the night and I hopefully I’m okay from now on. The restaurant downstairs is providing us with meals, which is pretty nice. Corn Flakes and dinner rolls aren’t my typical race day breakfast, but it’s something to eat and there is coffee so I’m doing just fine. All of these things (hard-springy bed, broken shower, different meals) sometimes make me nervous, but I feel pretty calm. I’m enjoying the experience and learning to just go with what I’ve got. It’s teaching me to let go of the rigid race routine I like to pretend I don’t have. So on to the race…same old things going through my head (put yourself in it, no gaps, don’t wait too late to move, etc.) but I was also trying to push the fact that I was coming off a much less than ideal USA Champs race out of my mind. I stayed relaxed and in a good position. When I fell off the leaders, I found myself alone with some wind for a bit, but I was still okay. I got caught at the line and bumped off the podium, but I still consider it a solid start. I ran 9:01, which is not a PR, but it’s far better than what I did a week and a half ago. It has reassured me that my mind and body are still in race mode and given me confidence for my next two out here. And the little kids that swarm you at the finish line, asking for autographs and pictures and if they can keep your bib number make you feel like a rock star! Lesson learned: bad things happen that won’t affect anything but your brain. You can’t let them. It has taken me a while to think of what to write about this weekend. Not much can ease the feeling of disappointment in a bad race. 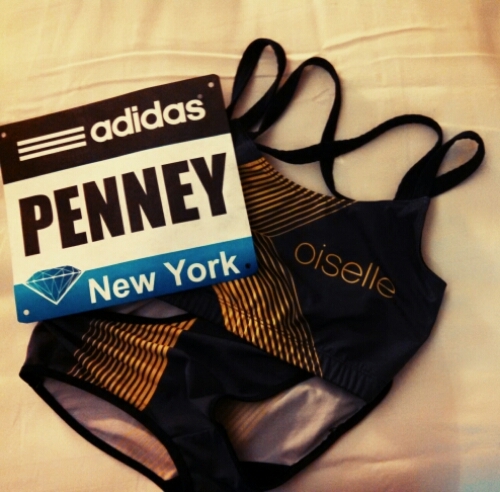 I’m fortunate enough to have my Oiselle and NJNYTC families’ support, which made it a little easier. I was often reminded that everyone has bad races, something I’ve certainly always known, but the USA Championships are never a good time for it to happen. I had high expectations for myself. I’ve improved so much this season and felt great in preparations. Unfortunately, I let a little bad luck with some poison oak get in my head and I just didn’t have it on race day. A rash first showed up Thursday morning and I spent most of my time for the next 24 hours trying to figure out what it was and how to get rid of it without taking something that would make me fall asleep or be on the banned substance list. Poison oak is irritating and itchy, but it doesn’t affect your ability to run, and therefore it is absolutely no excuse for my poor performance. No matter how many times I told myself I was fine, I wasn’t very convincing and I let myself stress out about it instead. By race time, I put myself in a decent position at the mile, but by 2k I felt spent. As I felt myself falling farther and farther back, it took some mental strength to remember that I never want to drop out of a race. It was far from the USA Championship race I imagined, but it happened. Now it’s time to pick myself up and learn from it. On a happier note, it was a pretty great weekend for many of my NJNY teammates. With so many finals qualifiers and podium finishes for Ashley Higginson and Donn Cabral, I couldn’t be more proud to be part of such a group. It was also very exciting to see so many Oiselle birds competing. Only big things ahead on both fronts. Don’t get overwhelmed by my surroundings. The closest meet I had to compare this one to was Millrose this winter. And while the circumstances for this meet were different (I didn’t find out I was in 24 hours before the race), they were both high profile races that tend to make me nervous. When I reflected on my experience at Millrose, I realized I needed to be more confident despite the huge stage I was on. I wanted to go to Adidas, be confident, and run like I knew I was capable of running even with the huge names that were in the race with me, the packed stands, and flashy cameras. The 8:56 I ran indoor was a big ten second PR from the previous winter and I was very proud and excited about it. But that was early in the year and I have been training hard. In a race that was bound to go fast, I knew I could do even better. This one is from Gag minutes before getting on the track. I think it pulls my first two goals together. Competing meant putting myself in the race and being aggressive. It meant not thinking too much about the time to get that PR but running the race that was in front of me and letting the PR come. I think I accomplished my goals with varying degrees of success. I was not too overwhelmed by where I was, I felt much more comfortable this time. This was largely due to the company I had in my teammates, Ashley Higginson and Nicole Schappert, who ran the 3k as well. I did run a new PR, but, like the Oxy 1500, it was only by one second. I would have liked to get closer to 8:50, but I’ll take a PR anyway and I know I’ll have other opportunities. Finally, for the most part I was competitive. I knew the leaders were going out at a pace that was unrealistic for me to go for, but I would have my own pack to compete with. I stayed calm but attached for the first mile and a half, and I had a kick for the last 200M. Looking back, I wish I had made a move earlier. I could have trusted my strength a little more and tried to go when the leaders of my pack did. But there are always things I think I can improve on and each race is a lesson for next time. In general, I’m pretty happy with my first Diamond League experience. In the past, this time of year has been pretty much the end of the season for me, but now things are just heating up! In just over a week I’ll be out in Sacramento running the 5k in the USA Championships, and a week after that I’ll head over to Europe! Big things ahead, can’t wait!